The Tsarnaev brothers were set up by the FBI. There are not eyewitnesses to connect Dzhokhar Tsarnaev to the bombs in Boston, Tamerlan Tsarnaev worked for the FBI, there were more then two bombs among many other problems with the Official Version of events in Boston. The US media is winding itself up for the show trial of the 21st century. What is really on trial here? The most obvious candidate is the US legal system itself. Innocent until proven guilty? This is a trial of a "terrorist", so this quaint Anglo-Saxon legal custom does not apply. The only requirement for jurors is that they live in the Boston area and are not opposed to the death penalty. Dimitrov was a life-long Communist organizer arrested in Germany at the time of the fire. He was a native of Bulgaria and not an native German speaker. Dimitrov not only conducted his own defence at the trial, but was found INNOCENT. Realizing the political pressure he was under the judge Dr. Wilhelm Bünger found that there was a Communist conspiracy to burn down the Reichstag but there was no evidence to connect Dimitrov and most of the others arrested with the fire. Is there any possibility that the case against Dzhokhar Tsarnaev will turn out the same? Perhaps his only hope is that a recent survey found a sizable number of Boston residents—42 percent—are still “unsure" about the “official” version of events. (3) The case is really a flimsy tissue of lies, but who is brave enough to tell the Emperor he has no clothes? Is it a Show Trial? There is total acceptance of the Official Story in the mainstream media. The "alternative" media in the US is not much different. Most of the people who really know what happened in Boston work for the FBI or the Boston Police. They are not likely to explain the details to us any time soon. Still, it is quite clear that the Official Story told by the FBI is both implausible and inconsistent with many credible reports. This artcicle will examine a range of topics which together show that the Official Story is a totally distorted account of what really happened in Boston in April 2013. There are no witnesses to link the Tsarnaev brothers to the bombs. Notice that the description he gave helped authorities "narrow down" their search, which concluded with the identification of the Tsarnaev brothers. The description quoted in the Bloomberg article, "a man wearing a cap, sunglasses and a black jacket over a hooded sweatshirt", is clearly going to pick out any number of different young men around such a sporting event. (7) The same may be said for his description of a backpack. Jeff Bauman did not pick either of the brothers out in a line-up. He saw someone drop a bag and gave the FBI a description which THEY USED to identify the Tsarnaev brothers. There was a bomb drill taking place during the Boston Marathon. Employees of Craft International, a private security firm, were present. The Craft International agents are clearly visible. They have black jackets, tan pants and black caps. Several can be seen in photos of the finish line. (11) These security contractors are not acknowledged in the Official Story. If they were supposed to prevent something from happening, they obviously failed. Also, just after the explosions an unmarked SUV appeared with more Craft agents and a roof full of communications equipment. Then a truck from the FBI bomb squad pulls up and a female FBI agent emerges. She talks with some of the Craft agents and then they disappear. The contractors have torn up the skirting around one of the bleachers apparently looking for something and later this area is taped off. (12) Were they looking for another bomb? Tasrnaevs' backpacks do not match a bomb backpack. 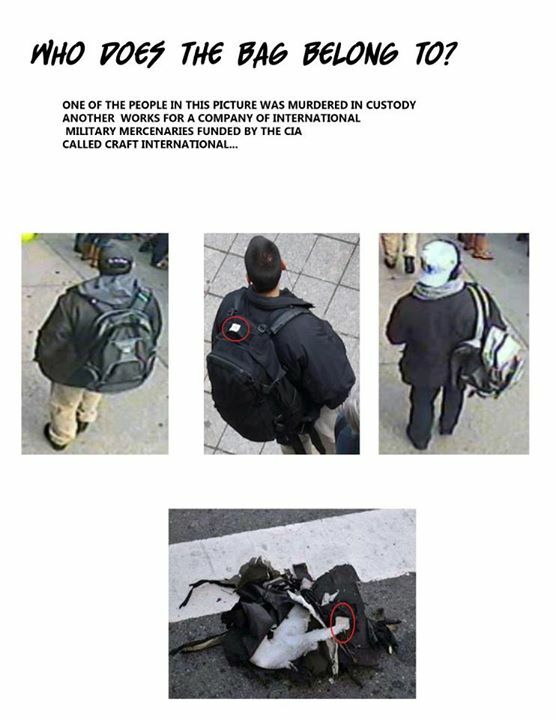 Pictures of bags carried by the Tsarnaev brothers do no match picture of a bag used to carry an explosive device, which is clearly black in the photos with a white patch on top. The older brother Tamerlan has grey backpack, while the younger brother Dzokhar has white backpack. See PHOTO A below. Craft employee's backpack does match a bomb backpack. While the Tsarnaevs backpacks do not match a bag which apparently carried an explosive device, it does match a black backpack worn by a Craft operative. "That backpack (which apparently carried an explosive device) has a white square on top. The paramilitary bomber (in the Craft uniform) is the only person in any of the photos with a backpack featuring that white square. "(13) The photo in the article (PHOTO A) shows Tamerlan, a Craft agent, and Dzhokhar, each with backpack, and a black backpack after an explosion. There is evidence that one bomb was planted by Craft employees. There is evidence Craft operatives were standing where one of the bombs went off and then crossed the street. There is also a person crouching next to a back pack in a doorway. (15) One of the agents holds a radiation detector. (16) Kevin Barrett in Veterans Today writes: "Crime scene photographs show us who really planted the bombs. The bomber was a member of a paramilitary operative team (Craft International) wearing black caps with identical skull logos. The photo below shows the bomber fleeing the crime scene without his backpack. That backpack has a white square on top. The paramilitary bomber is the only person in any of the photos with a backpack featuring that white square. "(17) See PHOTO B. There were between three and five explosive devices near the finish line. The standard reply to this is put by LyubenV in a comment on YouTube: "It's not bombing exercises you retard. They are having a controlled explosion of a suspected bomb. You can't transport suspect packages, they might blow up. So what they did was evacuate the area, and blow it up from a safe distance." This account is confirmed by a report from the Providence Journal: "A third explosion was heard about an hour after the first two after authorities warned spectators to expect a loud noise from a water cannon that police apparently were using to destroy one of the devices. "(22) These reports indicate that there were either three or four explosive devices near the finish line, not just the two which are central to the Official Story. Did the accused brothers also plant the bomb apparently exploded later opposite the library? If they didn't, who did? According to his mother, Zubeidat Tsarnaeva, Tamerlan Tsarnaev had been working for the FBI. She added that Tamerlan always told her what was going on. This statement probably forced the FBI to admit that they had "interviewed" the brothers in 2011. This spin is how the Official Story deals with the connection between Tamerlan and the FBI, but his mother quite explicitly stated that he was controlled by the FBI. Her statement is simply ignored or dismissed. If he was controlled by the FBI, he was not a "suspect", he was working for them. Is this claim credible? Here the obvious question is: Who do you believe? If you believe the FBI, you are on the way to accepting the Official Story. If, like me, you accept the statement by Zubeidat Tsarnaeva, then you can begin to see the whole scenario in a totally different light. One good reason for not believing the FBI on this point is that time and time again the FBI has been found to set people up so they can later be "discovered" and arrested for attempted bombings. (27) This is expressed well by Bill Van Auken in Global Research: "One thing is clear: the Boston bombing, like virtually every other major terrorist incident, real or invented, since the September 11, 2001 ---was carried out by someone who was known to and under surveillance by US intelligence agencies." In many cases the people arrested were part of a "sting" operation organized by the FBI or police. (28) But there is another quite specific reason not to accept the FBI story about their connection with Tamerlan. Tamerlan Tsarnaev has been linked to US funded Chechen separatist organization. Tamerlan Tsarnaev was captured alive by police and handed over to the FBI. The claim that Tamerlan Tsarnaev was captured alive is the other suggestion which completely undermines the Official Story. Global Research presents a report and interview from a local TV station made just after Tamerlan was captured by the police. (34) The naked man shown being captured on TV has been positively identified as Tamerlan Tsarnaev by his aunt Maret Tsarnaeva. This has been reported by Dan Dicks of PressForTruth. (35) There is also an audio recording of a woman Linda who claims to have seen the police run over Tamerlan and then shoot him near or outside the place she was staying. (36) Later he is said to have died either in a shoot-out with police or run over by his brother. (37) Needless to say, this is denied by the police in Watertown. They say it was another man, but the identity of the other man has not been released. (38) If these reports are correct, Tamerlan was killed while in the custody of the FBI. Dzhokhar himself claims he was set up in his last message to his father. Dzhokhar Tsarnaev's last message on Vkontakte (Russian Facebook) to his father reads as follows: "This will be the last message before the police get me. I never done it. They set me up. Father please forgive me. I am sorry it has come to this. "(40) Someone noted that it was in English, not Russian, but the reason could be simple. He wanted people in the US to understand it as well. In a report on the BBC dated 16 May, 2013, Dzhokar Tsarnaev left a hand written note in the boat where he was captured saying that the victims of the bombings were "collateral damage", and the attack itself was retribution for the US wars in Iraq and Afghanistan. Apparently "the content of the note sounds similar to what Mr Tsarnaev reportedly told officials as he was interrogated at a hospital. "(41) So are we to believe he lied to his father while he was free, but told the truth when he was the custody of the FBI? Tamerlan's uncle, Ruslan Tsarni, also has links to CIA and Chechen separatists. Ruslan Tsarni (formerly Tsarnaev) has worked with the USAID around the Caucasus region, and in 1995 set up the Congress of Chechen International Organizations. He was also married to the daughter of Graham Fuller, a former CIA station chief in Kabul with an interest in Islamic extremism. (42) An article by Daniel Hopsicker shows that in 1996 Ruslan Tsarni was involved in actively aiding Islamic terrorists in Chechnya. Since 2008 he has worked for a USAID program of economic assistance for Kyrgyzstan. (43) This suggests Tamerlan could have been aware of the US work with Chechen separatists. It also indicates the suggestion he was himself involved is hardly far-fetched. 18.There is no access to the photo referred to in this quote from the VT article. (The comment is "Hey Bro, where'd your backpack go?") However here is the location of two photos which shows the Craft agent with the backpack + white square and later running away without any backpack: http://whowhatwhy.com/wp-content/uploads/2013/05/7.png.